CVB's Padamrutha foot care oinment gives ultimate protection and healing from cracked foots. 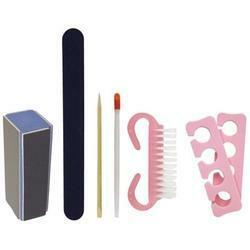 This Pedicure Kit consists of 20 High quality instruments. This product is devloped specially for professional use. Darrick foot spa kit gives an option to do your pedicure at home very comfortably. Good foot hygiene is most important for foot care. Bad odour, tiredness, rough, dry and cracked heels can be caused by various factors.Darrick foot spa kit is specially formulated to protect feet discomfort, aching feet, cracked heels callus, dry feet and bad odour. Pamper your feet with Our Complet Mini Foot Care Kit loaded with natural products. INATUR Glory Feet Spray is enriched with natural essential oils and pure extracts. Regular usage of the product helps to absorb excess moisture and removes dead skin, impeding the growth of athlete foot, fungus and warts. We are offering an excellent range of Foot Care products, which are processed from natural herbs. These are very good for skin and if applied on foot then it gives nourishment to them and assures beautiful feet. These products have high demand in both Indian as well as overseas markets due to its excellent quality and affordable prices. The cream is enriched with Seaweed Extract that is packed with high concentration of vitamins, minerals, amino acids and antioxidants. It helps control damage caused by free radicals and helps to get beautiful and healthy skin, tips & toes. Cuticle Care Kit is a specially curated nail care set for healthy nails. One spray on each fingertip where the skin meets the nail.